Around 50,000 people on Sunday (June 4) night defied the Islamist killjoys who had claimed 29 lives in attacks on innocent people enjoying themselves in Manchester and London. US popstar Ariana Grande and a host of other stars put on a special concert to raise money for the victims of a suicide bomb attack on people attending her first concert in the city 13 days ago. There are many forms of courage. Running towards murderous terrorists who are wearing suicide bomb vests to stop them attacking people is the most visceral form. But attending a pop concert in Manchester was also an act of courage for thousands of music fans. The emotions showing on their faces made that clear. Only 13 days earlier 22 people died when a suicide bomber, Salman Abedi, blew himself up in the foyer of the Manchester Arena seconds after an Ariana Grande concert. And less than 24 hours earlier three terrorists wrought more havoc in London, killing seven people in a van and knife attack. Two women wrapped in thermal blankets stand near the Manchester Arena, where U.S. singer Ariana Grande had been performing, in Manchester, northern England, Britain, May 23, 2017. Jac Hardy-Keeley came to Old Trafford cricket ground on Sunday with her daughters Blossom, 8, and Bella, 14, and their cousins Chloe, 13, Rowan. 19, and Eden, 21. They were all at the first concert and had vivid memories of the terrifying "bang," the black smoke and the blood and "so many police cars" outside the arena. "When I heard about what had happened in London it made me think twice about coming. It almost put me off but the girls persuaded me to come," Ms Hardy-Keeley said. "They need to stop it. They are not gaining anything. They are just harming children and innocent people. They know who they are targeting and they're not bothered," Rowan told Sputnik. Ariana Grande was joined on stage by Justin Bieber, Miley Cyrus, Katy Perry, Pharrell Williams, Coldplay, Take That and guest star Liam Gallagher of Manchester's most famous band, Oasis. All ticket sales from the One Love Manchester concert were donated to a fund, overseen by the Red Cross, for the families of victims and survivors of the May 22 attack. Fans wore special T-shirts bearing a worker bee logo, which has been used to symbolize the industriousness and solidarity of Mancunians. They held up placards saying simply, "For Our Angels." Pharrell Williams said that despite the events of the last two weeks he did not "see or smell any fear" from the people of Manchester. Grande's manager Scooter Braun told the cheering crowd: "Last night (Saturday) you were challenged and you had a decision whether you came here tonight but you stared fear right in the face and said 'We are Manchester and the world is watching.' "
Indeed the whole world was watching with a TV audience of many millions, including viewers of the ABC network in the US and even on China's Tencent platform. Many of the songs chosen had lyrics which echoed the fans' sentiments of solidarity and defiance. 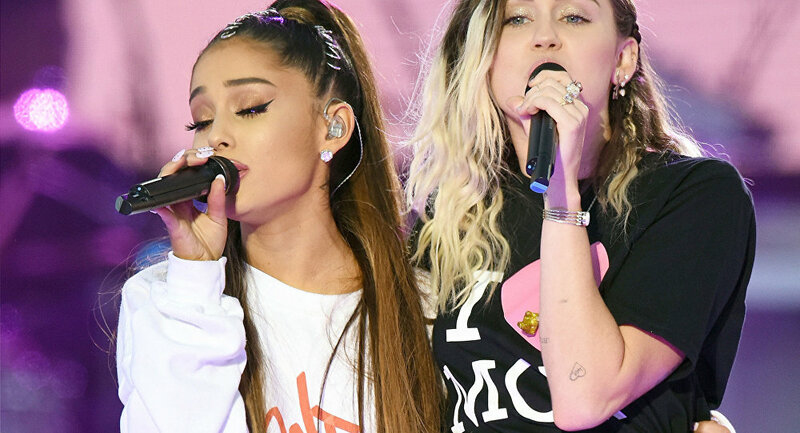 Grande and Cyrus sang a version of Crowded House's "Don't Dream It's Over" which contained the chorus: "They come to build a wall between us. And we know they won't win." Grande then joined the Black Eyed Peas for a rendition of their hit "Where Is The Love?" where the lyrics refer to "people killing and dying" and "children crying" and asks the listener if they can "turn the other cheek." That is what the British people are being urged to do. The alternative is to fall into Daesh's trap and launch an illogical pogrom against all Muslims. As Esso Traynor, who attended both concerts with his 10-year-old daughter Robyn, said: "At the moment all terrorists seem to be Muslims, but not all Muslims are terrorists." Robyn herself said she actually "felt safer" having overcome her fear to attend Sunday's concert. Joanne Davies and her husband Anthony, from nearby Oldham, said they had several Muslim friends and knew the attackers had nothing to do with the real Islamic faith. "We wanted to show our support. Being a Mancunian and having something so dreadful happen in our own city it has been astonishing to see the response. It's just to show that we are not frightened, although we were a bit more apprehensive, but we just had to come to stand in solidarity," Mrs. Davies told Sputnik. 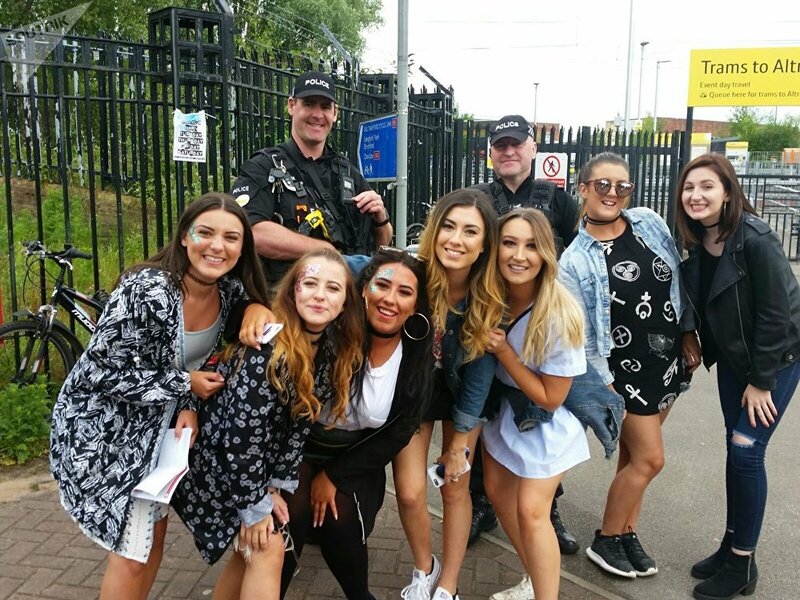 Sergeant Ian Carr from Greater Manchester Police said everybody had behaved impeccably and had given great support to the police. He said some quite small children had shown incredible bravery in coming despite clearly being scared. "Some of the younger children, especially the ones who were at the first concert, have been quite upset but everyone has been great." "We knew people at the first concert and we came to show our support for Manchester and to show ISIS [Daesh] that we were not afraid of them. We will stand together."